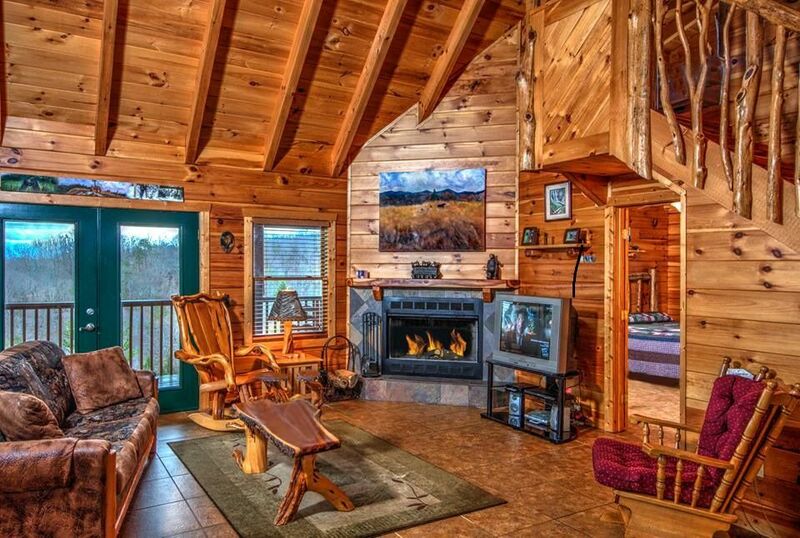 '1 of a Kind', a 1,200 square foot log cabin, is nestled snugly in the Smoky Mountains. The cabin's stairway is handcrafted from the Cedar trees that were harvested to build the cabin. You will enjoy total seclusion because this cabin is located at the very top of a private Mountain. From the two large wooden decks and the cozy balcony, you can watch the beautiful Sunrise and the Sunset. Cabin Layout: The first-floor level has the living room, fully-equipped kitchen, dining area, the bedroom with a King size bed, a bathroom with a whirlpool tub and a 4-head custom-built tile shower. The bathroom is completely handicapped-accessible. The game room (upstairs level) is well furnished for your enjoyment with a fun pool table, small pinball machine, dartboard, numerous board games, and a futon. The second Bathroom, with its custom tile shower, is on this level. Other unique features '1 Of A Kind' offers are 3 sets of French Doors you can open to feel like you are right outside, a fun outdoor fire pit for roasting hot dogs or marshmallows and even a unique romantic indoor waterfall located in a corner of the living room. The owners are John & Shelly Soter, As a 30 year Carpenter. I always wanted to build my Mother a house. Since she would not move to TN. We built her a vacation home. Everything was hand crafted with allot of love and creativity. Now both of our parents, have this beautiful piece of the mountains to enjoy anytime they want. And we would like to share it with you as well. We bought this property with a vision of the most amazing Log Cabin I could dream up. When we found this land at the dead end of the street. Then climbed to the top and saw the views, we knew this was going to be ours. It was one of the most amazing properties we had ever seen. After a year of allot of hard work. We finished building 1 of a Kind. 360 Views, Completely private but close to everything, Can see for Miles, Fire Pit is awesome, The King size Log bed is extremely comfortable, The shower is extra large with 4 shower heads, Custom shower upstairs, Handmade furniture, Cedar staircase, Custom original art work. Amazing place to relax. Bath is completely Handicap accessible. Shower is 6x6 large enough for 2 with his and her's shower heads as well as a rain maker in the ceiling and handheld shower heads, With a Whirlpool tub, easy access sink. and lot's of Cedar accents throughout the bathroom. The Mountain Views are amazing 360 degrees around this cabin there are views. The cabin has towels provided, Please leave wet towels on the floor in the bathroom. Comfortable couch and hand made rocking chair. and hand made tables. Stereo, CD player, Romantic indirect lighting. There are 3 large decks, The back is covered and on the upstairs deck you can watch the sun rise, and set from the same spot. Hot Tub has incredible Mountain Views! This place was incredible. This place is secluded enough to enjoy a peace and quiet vacation with either family or a loved one but also has house close enough around you to feel safe! The view from the back deck in the morning is incredible. Being only 30 minutes from the Pigeon Forge entrance to the park was definitely a perk, but this house also comes stocked with anything you may need so if you are looking for a peaceful weekend in this is perfect! My husband, our dog and I thoroughly enjoyed our stay at one of a kind. Secluded but close to any activities. We loved watching the sunrise over the mountains from the hot tub on the deck ! This cabin is absolutely beautiful, from the inside, to the drive out, to the views. This was exactly what we were looking for to get some R&R. Incredibly private, sunrise and sunset were extraordinary, and a view of the moon and stars from the hot tub cannot be beat. This is a bit out from Pigeon Forge (about 20-25 mins) and farther from Gatlinburg because of the heavy traffic if you are looking to spend most of your time down there. We were in just to hike and relax so it was phenomenal, exceeded our expectations. Amazing views,very clean,everything you need is there. Me and my husband went for our 2nd Anniversary and we will definitely be back!! My husband and I ran away from our responsibilities for 2 nights at this 1 Of A Kind cabin. It's appropriately named. The views are astounding. Pictures do not do it justice. This cabin is the most beautiful cabin we have stayed in. Again, pictures do not do the inside of the cabin justice. The woodwork is phenomenal and the downstairs bathroom is my dream bathroom. My husband fell in love with the coffee table and the big rocker near the fireplace. Outside we enjoyed the wrap around views of the mountains. All you see are mountains for miles. We loved watching the sunrise on the back balcony in the hot tub. The most relaxing way to start your day. You must run upstairs to capture the sunrise and sunset at the most perfect spot though. It's an experience you do not want to miss. John and his wife are so helpful and informative about the area. If you need suggestions for places to eat, things to do, or places to hike John will have the best recommendations. They are the best hosts a guest could ask for. We will be returning to this lovely cabin. The cabin was perfect! My daughter, dog and I relaxed all weekend. We thought about leaving and visiting Pigeon Forge and/or Gatlinburg, but loved the spot so much that we never left! The hot tub, fire pit, and views were so mesmerizing that we were compelled to just stay at the cabin all weekend. Definitely would like to return!